Stackable Make it good. Make it stackable. In this post I will be showing the first steps in a processing chain that fulfills these requirements. If you follow these instructions, you should be able to easily build your own stereo camera and calibrate it. I’ll be splitting up the process into a few separate posts to keep it from getting too long. The important thing about calibrated stereo photography is that the cameras have the same relationship to each other in each picture. This means that the transformation from one perspective to the other is known for each picture in each stereo pair, leaving only the work of figuring out the relationship of the objects photographed to the cameras when you’re doing 3D reconstruction. So to start, you need to build a stereo rig that will hold both of your two cameras in the same position when you’re taking pictures. I used two cameras of the same model. This is not absolutely necessary – the whole point of calibration is empirically finding out the parameters of each camera in question, and their relation to each other. Since this is an empirical process, there is no assumption and, really, no need for the cameras to be identical. They won’t be. But using the same resolution prevents postprocessing errors due to resampling, and having the same focal length just makes the whole process easier. I ended up settling for the Logitech C270. It cost 18.83€ at the time I wrote this post on Amazon, so for both cameras you’re paying less than 40€. I picked this camera because it’s cheap and because it’s easy to modify it if you want to capture near-infrared for e.g. NDVI pictures (for a list of cameras that have been shown to be convertible to capture near-infrared, often with instructions, see this excellent site at Public Labs). The Lenovo C270, one of the pair I’m using for the stereo vision project. According to Public Labs this is a camera that is easy to convert to be able to see near-infrared. The rest can be made from stuff that you probably have lying around your house, or you can buy it for under 10€ just about anywhere. 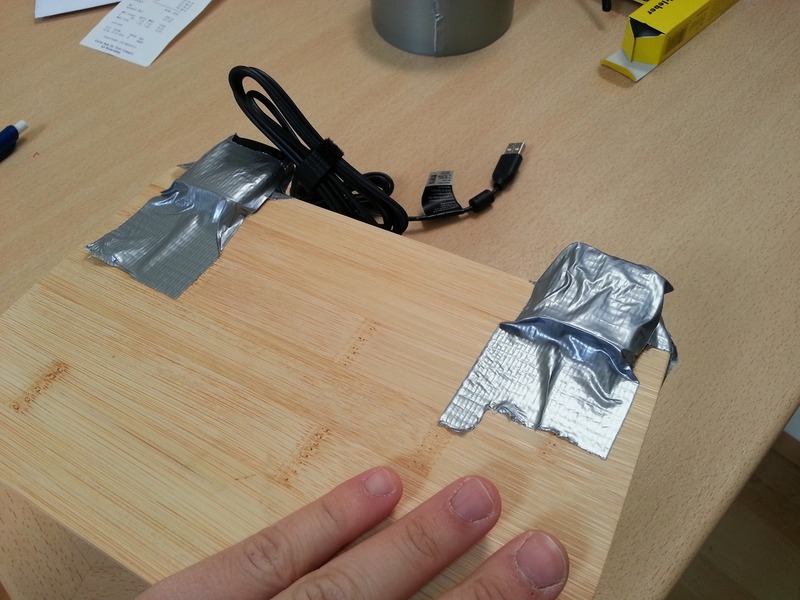 They are a flat board to attach the cameras to, some universal glue to attach the cameras to it and some duct tape just for good measure. You’ll also need a flat chessboard, which can either be a real chessboard or a printed chessboard glued to a flat surface (back of a cereal box, etc.). The first step is to find some surface that you can attach the cameras to. The most important point here is that it’s rigid so that the cameras don’t move. 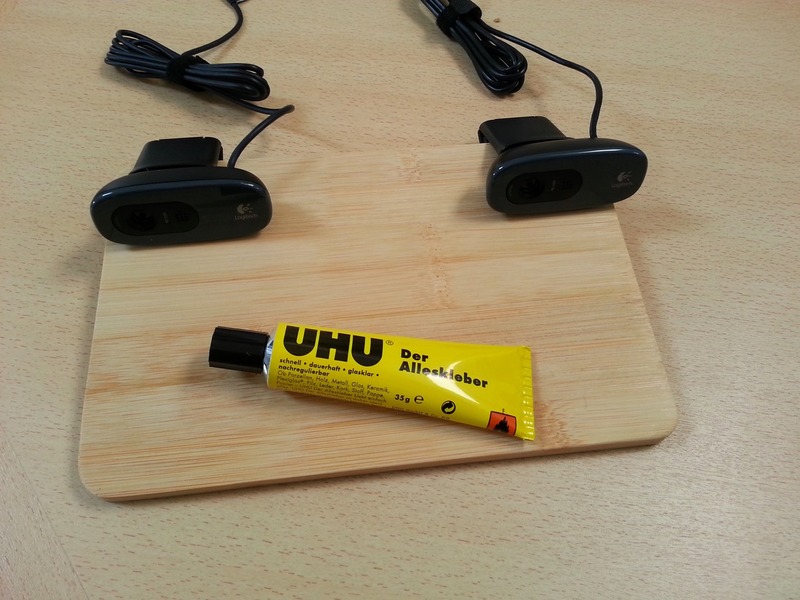 I did that by gluing the cameras to a thin wooden board. The cameras on the actual board I’ll be using. Right here they’re held on only by glue. This held them pretty firmly, but for good measure I taped them down on both sides with some duct tape. A more permanent solution would be to drill a hole through the cameras’ clips that goes through the board and then screw them into place, but as this is a prototype I didn’t do that. In a final version, I’ll surely be using other cameras without casings and something more sturdy and lighter than an entire board like this. The point is just to have something that creates 3D images so that I can profile it on different hardware platforms and use it for some rudimentary mapping. The glued on cameras, duct taped for extra safety. As you can see, the duct tape holds them in place quite well. After that, connect the cameras to your computer and you’re done! Toaster and fruit not included. The entire setup – the camera rig, plus the printed chessboard taped to another board. I’ve already mentioned that I took heavy inspiration from Martin Peris. In fact, if you go to his page, you’ll find working code that will do almost all of the steps I describe in this post. I decided to write my own code nonetheless, not because the code was bad, but because the workflow is not as clear, some parts of the implementation are left to the user, and it’s in C, using the old OpenCV C API. I wrote my implementation in Python for easier understanding and maintenance, and also because I’ll probably reuse the StereoPair class that I used to access the cameras as a pair, either in further Python programs or as a prototype for a C++ class if I’m running it on a Pi or something similar. The StereoPair class makes it a bit simpler if you’re working with stereo cameras in Python, and it cleans up after itself by freeing up the cameras when an object is destroyed. Feel free to use it if you like! Show video from two webcams. Press 'q' to exit. Folder to write output images to. --interval INTERVAL   Interval (s) to take pictures in. If your rig is set up right, the program should show something like this when you run it – the video from both perspectives in two separate windows. Things to watch out for are using the right device numbers. My computer recognizes its built in webcam as device 0, but if I connect both cameras before starting up it’s 1, whereas the cameras are 0 and 2, respectively. Also, if you get messages that your USB controller is out of memory, try switching to use different ports. To be sure, I always connected my cameras at startup and left them connected the entire time, but it theoretically shouldn’t matter if you unplug and reconnect them from a live system. For the calibration, you will need lots of pictures of the chessboard. It’s important that the chessboard is visible for both cameras simultaneously, and optimally it should be photographed from several different angles and positions. You can either write your own software to do that, or manually take a lot of pictures with both cameras and match them up later, or you can use capture_chessboards that takes care of all of that for you. If you want to both capture chessboards and calibrate the camera in one step, you can use the calibrate_cameras utility. The script asks you for the details on the cameras, the number of inside corners in the chessboard’s rows and columns (the example picture I show above, for example, does not use an 8×8 board and that’s just fine), how many pictures you want and where to save it to. It then keeps on checking the pictures to see if it can find a chessboard in both camera captures. If it does, it stores both pictures in the output folder and waits five seconds so you can reposition. For my purposes, I set it to take 50 pictures. left                  Device numbers for the left camera. right                 Device numbers for the right camera. output_folder         Folder to save the images to. --rows ROWS           Number of inside corners in the chessboard's rows. --columns COLUMNS     Number of inside corners in the chessboard's columns. Size of chessboard squares in cm. Folder to save camera calibration to. A selection of the stereo images my stereo rig collected. Now you’ve got the raw data that you need to calibrate your cameras. Check out the next post to find out how to complete the last steps of the camera calibration and start shooting depth maps! My name’s Daniel Lee. I’m an enthusiast for open source and sharing. I grew up in the United States and did my doctorate in Germany. I've founded a company for planning solar power. I've worked on analog space suit interfaces, drones and a bunch of other things in my free time. I'm also involved in standards work for meteorological data. I worked for a while German Weather Service on improving forecasts for weather and renewable power production. I later led the team for data ingest there before I started my current job, engineering software and data formats at EUMETSAT. what was the c270 camera’s focal length and did you get efficient results? what was your mean projection error and did you calculate the distance of the objects?? The calibration is independent of the focal length, although you will get best results with cameras that have focal lengths of around 50mm – this is pretty close to the undistorted view from a human eye. Due to the calibration, you can minimize your projection error, but it’s always going to be different depending on your camera, how you pit together your stereo rig and what calibration pictures you took – in this respect lighting plays an important role too. In my specific instance, I managed to get a projection error of under a pixel, but remember that 1. The reprojection error will be different depending on the pictures you take and 2. It tells you he reprojection error for the chessboards in the calibration pictures. Measuring the error objectively is difficult because when you produce a point cloud, it’s a huge number of points that normally match with varying degrees of accuracy to objects that you may have limited knowledge about, so I haven’t converted that into any kind of skill score. However, the results are very plausible, if you take a look at the posts following this one I have a lot of examples that might interest you. thanks for your tutorial and contribition on this site. I have resently started on working on linux achitecture Ubuntu 12.04 – and very interested on this Opencv working on a stereovision project. First of all, I should mentioned – that I am a beginner on a linux machine coming from a pc environment. I have of course all the appropriate software and libraries (like OpenCv running on ubuntu 12.04 LTS on a 32bit machine etc) How ever, on Martins site – he mentions about using Coriander to shot the various checker board angles. Hence, I have installed this coriander – but theres really now documentantion on how to run this program with my USB webcams. I could only get one webcam LEFT to run and another and the RIGHT webcam appears as a black box. Lastly, you could point me into some alternatives I would greatly appreciate this!!! I’m not familiar with Coriander, but the software I present in this blog entry should work just fine. Have you tried using it? thanks for your reply! And are you referring about the link above called “calibrate camera utility”? Or are you referring about the first link called “capture chessboard”? Hence, when I’ve clicked them both – they both are linked to something highlighted blue saying “stereovision”…. Could you send me a direct link to mngr5@msn.com with some directions on installing this in the terminal. Yes, that’s the link I’m referring to. It’s part of the StereoVision package, which is also linked in this post. I suggest you follow the links and take a look at the packages there. If you click on the StereoVision link, for example, you’ll call up the documentation for StereoVision. The first page is quite short and has the instructions for installing the software – a single line for the command line – highlighted so you can’t miss it. The other links to single parts of the package also lead you to a page where you can find those same instructions. I really appreciate your interest in the content and code here and am happy to help you, but so many people visit this blog that I don’t help people by email. If I answer questions here, they are more likely to be found by people who want to ask the same question. As far as instructions for installing things on the command line are concerned, see the instructions in the links. If you don’t unerstand those, then your best course of action would be to consult some general manuals on working on the command line or maybe ask a friend who can help you out – it’s really hard to find the exact cause of trouble remotely and it sounds like what you’re probably missing are the basics, so it’s hard to say exactly how I could help you there. Also, if you’re interested in working more with your stereo camera, e.g. in using it to create 3D point clouds of objects you image, see the posts following this one. They’ve got detailed instructions on how to do that. I was maybe doing a tar install on the desktop than move it to the appropriate folder later. Any feed back would be appreciated. Prefix the command with “sudo” and it should work. The error message is telling you that you don’t have write permission on that directory, which is due to the fact that you are executing the command as a normal user, not as admin. I’m honestly not sure how to help you more than referring to the blog – there you see a way of calling up the program’s help printout, which explains all of the options that the program offers you. I realize that you’re just starting off and I don’t want to discourage you in any way, but you’ll have to be more specific if you want more than the instructions contained here, for the simple reason that I don’t know what the problem is. A common problem faced by people when using 2 cameras with linux is a resolution restriction due to bandwidth limitations. 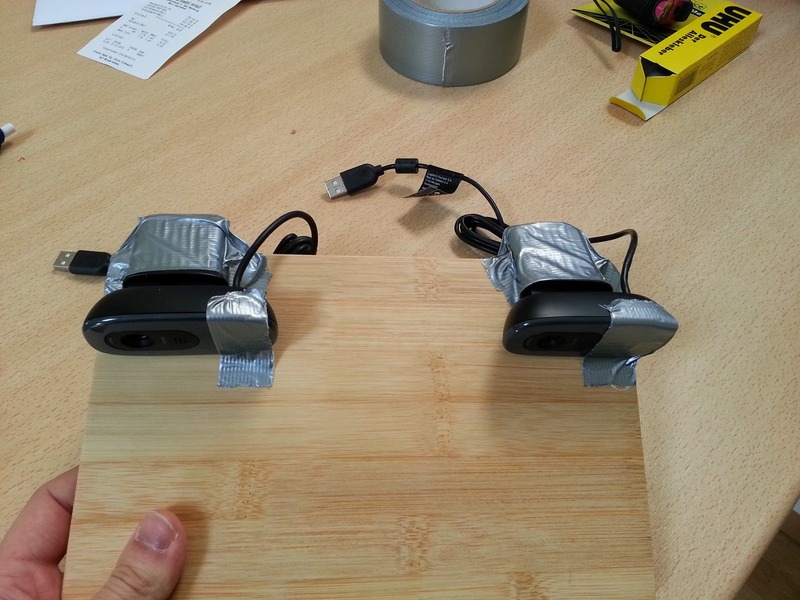 In my case im using a PCduino with a single usb port which allows me a max resolution of 320×240 per camera. In the StereoVision libraries, VideoCapture() is used which defaults to 640×480. This in turn results in an error : libv4l2: error turning on stream: No space left on device VIDIOC_STREAMON: No space left on device. “devices“ is an iterable containing the device numbers. to set the capture resolution with no success. Until i am able to reduce the resolution, I’m not able to use any of the functions. Your help would be much appreciated. I think you mean stereovision/stereo_cameras.py, right? stereovision.py doesn’t exist, but the code snippet you show is from stereo_cameras.py. I don’t see what you changed there though – it looks like lines 51-58 of the original code without being touched. Did you edit the file, or am I missing the difference? That would set the capture size of each capture to 320×240. Does that work for you? Awesome post. I wrote another version of stereo calibration code where you can calibrate a stereo camera in real time. I think it can be helpful for someone else. I am using the webcam C270 HD 720p for my project and to do some calculation I need the sensor name and dimentions and also the camera’s focal length. I would appreciate if you can send me this information. Sorry, but I can’t help you here – I don’t know the sensor name, dimensions, or the camera’s focal length. If you read the blog you’ll notice I have no affiliation with Logitech and all the calibration is done empirically, without any a priori knowledge of how the camera’s built. If you’re looking to duplicate my results, you don’t need that knowledge. Otherwise my suggestion would be to contact Logitech – the use of that specific webcam was simply a recommendation from me because it’s what I used. I’m new at stereo vision and python. I want to try your example codes but argparse didnt find any device or file etc. Can you give examples without argparse? or how can I fix argparse errors? Those aren’t argparse errors – the program is designed to be run from the command line and requires some input to function correctly. So running it from inside a Python interpreter isn’t the intended usage, although that definitely can work. If you read the output you’ll see its usage description. It tells you how to use the program from the command line. Try giving it the inputs it needs and it should work. Further description is on the blog – I would suggest reading the entire post so you know what the program wants. That in’sihtgs just what I’ve been looking for. Thanks! I am working at the same thing.but is there a problem if the cameras record a little different?I mean there is a slight difference in color from both cameras…could this affect the calibration? That shouldn’t be a problem, the calibration concerts to black and white first. Later on it should also be fine – the block matchers convert to black and white to find the matching points. The point clouds are colored using the input from the left camera, if I remember correctly, so you won’t have any conflicts there either. The error you’re seeing is actually the usage guide for the program. It requires a few arguments in order to be able to run, which are shown. If you provide these required arguments it should run – you called the program without any arguments, so it doesn’t know how to access your webcams. thanx alot for replying but im new to python and idont know how and where to provide this argument can u help or give me a link ? I don’t know Windows at all, normally I’d just start things from the command line but in Windows it’s probably harder to get there than in Linux. In PyCharm there should be plenty if ways to provide the arguments – google around and you should find them. That shouldn’t be a problem, the algorithm works with black and white images anyway and is robust to slight changes in lighting. The picture is not exactly the same because both are taken from different angles – the differences are what are used to produce the 3d image. I am facing some error when i tried to run your code and i don’t know how to fix it. If you look carefully at the traceback you’ll see that it comes down to an assertion error – OpenCV requires both the width and height of the picture it shows to be greater than 0 pixels. This isn’t the case. Did you enter a valid device number? First of all, thanks for the great posts! I have a couple of questions regarding the camera chosen for this process. 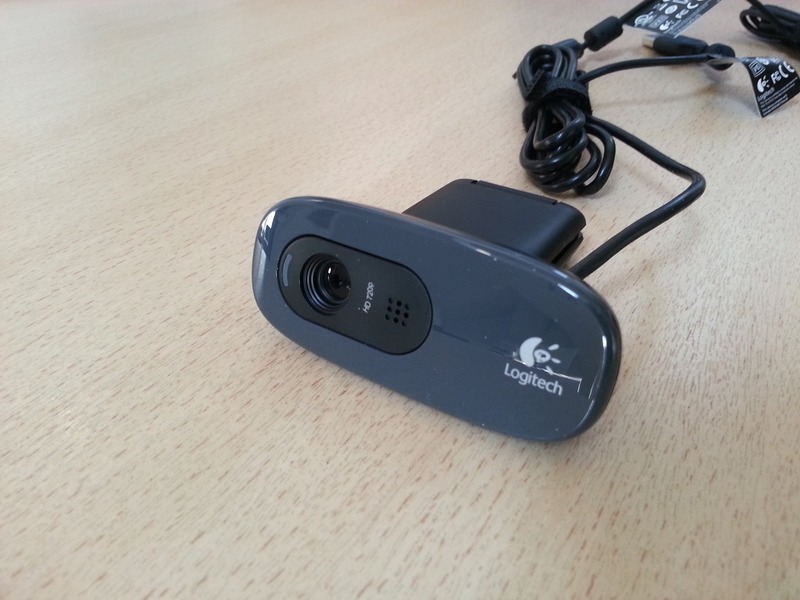 On this site that you mentioned in the post: http://publiclab.org/wiki/infragram-convertible-cameras it says ”Logitech C270 – This camera no longer has a removable IF filter, it has a coated IF filter. Therefore you cannot change the filter.” – 1. did you succeed in removing the filter on these cameras that you used? Have you tried? 2. is there any other type of WebCam you would recommend for purposes of making a stereo pair for 3D point clouds (having in mind the desirable maximum simplicity of the process and ability to remove IR filter) ? I’m looking forward to your answer, it would mean a lot to me, because I find this topic interesting and would like to make a paper about something similar. I have not tried removing the filter on the cameras I used, and if you’re looking into doing that I would suggest using the site you just referenced – Public Labs does the best job of anybody I know of maintaining good lists for cameras with removable filters thta let you get into NIR. The Creative Notebook Live camera looks quite promising and can be had for cheap – $8 according to the wiki page. What are you working on exactly? Would you be interested in collaborating more closely? Thanx for such useful work. "Take a number of pictures with a stereo camera in which a chessboard is "
"visible to both cameras. 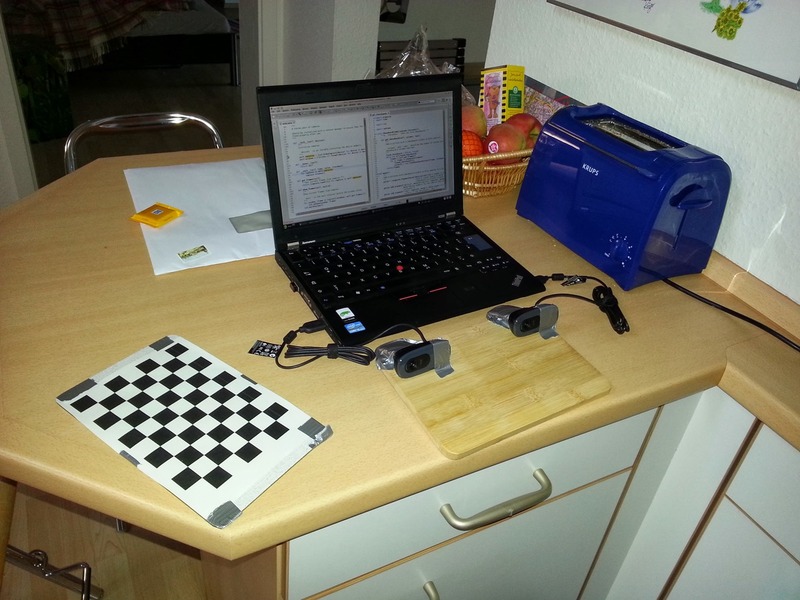 The program waits until a chessboard is detected in "
"both camera frames. The pictures are then saved to a file in the specified "
"output folder. After five seconds, the cameras are rescanned to find another "
"chessboard perspective. This continues until the specified number of pictures "
parser.add_argument("num_pictures", type=int, help="Number of valid "
parser.add_argument("--calibration-folder", help="Folder to save camera "
Also, in Python indentation is syntax relevant, so the code you pasted in at the top wouldn’t work. for a longer version of the help. Also, if you read the following post, which I reference in the post you’re reading right now, you’ll find even more information that will help you out. nmh is already the newest version. 0 upgraded, 0 newly installed, 0 to remove and 34 not upgraded. Hey Daniel if ‘show’ is installed as shown above why its showing that ‘show’ is not installed? You’re misspelling the command when you type it in. The computer is pretty dumb and won’t interpret what you enter – you have to use commands exactly according to the way they’re written. Here you’ve got a space in the middle of the program’s name, which is incorrect. Check your spelling and try it out again. Good luck! HI i would please like to ask what is the recommended resolution to use when capturing images with the camera. i imagine the higher the resolution of the camera , the more computing time it would take. have you got any idea on the optimum resolution? The resolution is really the result of your needs – for real time applications you might need less to save time, if you’re performing offline reconstructions and detail is a priority you can use high resolution. Also, it should be noted that you don’t have to compute the reconstructions on the same device that captured the images – the computations could be offloaded to a dedicated device, or a cloud application if you’re willing to build it. I’m new to Raspberry Pi and OpenCV. This looks like an interesting project I would like to try out. However, I’m facing some issues when trying to download and install your StereoVision package. I get the following error when I type pip install StereoVision. Would happen to be able to solve my problem? First of all my apologies for getting back to you so late! I don’t know why, but I didn’t see the alert about your comment until just now. Thanks for sharing. I have a question why the distance between two cameras are not used in the calibration process. By default, I think that is a very important parameter in the stereo system . Any reference on this? Yes, all that call does is calibrate using OpenCV. You can check their documentation for more information. 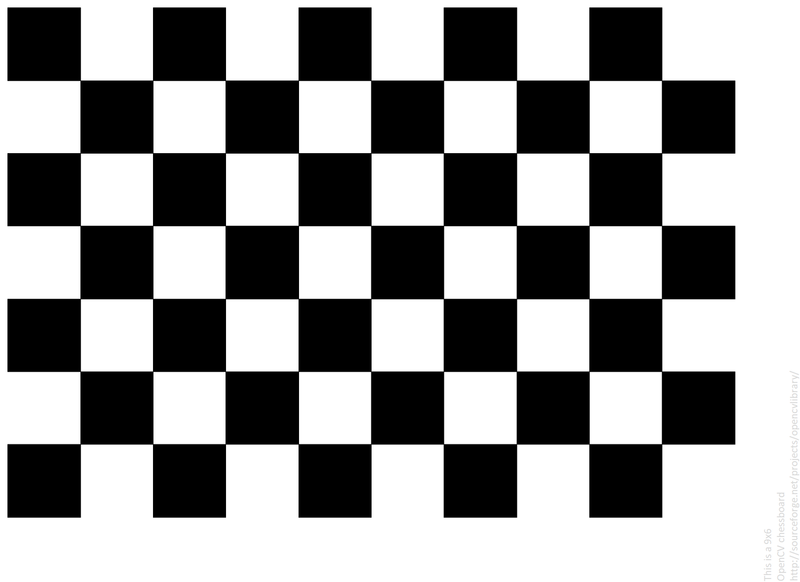 I think OpenCV extracts the metrics from the size of the squares in the chessboard you use for calibration. i am yogi, new to python scripting and stereo vision field. i am using stereovision concept to develop 3D point cloud data of honeycomb structure. can you please tell me which softwares do i need to install for getting started with this project at initial step. Hi Yogi, this is the first of a series of tutorials – they’re all connected by links. If you read them you’ll find out everything you need to know in order to get the things working. If you’re looking for general tips on how to program this is probably not the right place to find it but if you want materials for absolute beginners, I might suggest the other, bigger project I’m working on right now: fullstackembedded.com. You might also try Data Camp, which has great resources for anybody getting started. Thank you for this post. I am new to Computer Vision and it will be very helpful to me for getting started. 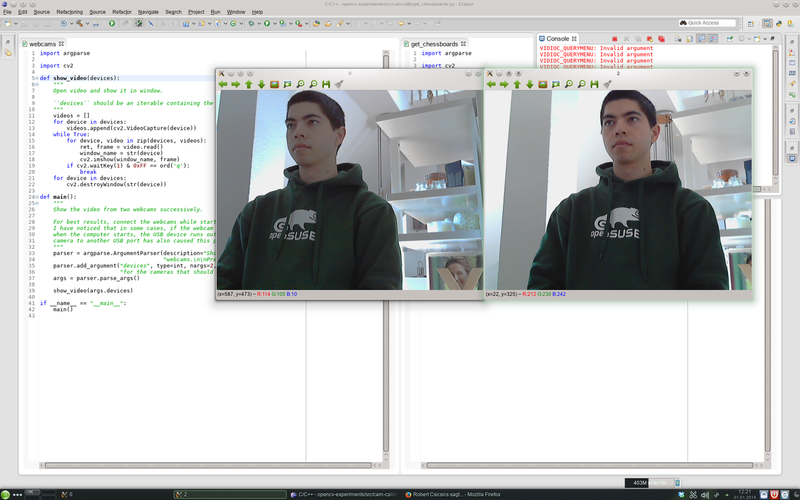 Currently, I am trying to use stereo vision for ego-estimation of a small four wheeled bot. I came across your blog while I was looking for ways to build my own stereo rig. Buying a stereo-camera set is out of question as it is too expensive. What I have realized is that the major problem people face is related to synchronizing the two separate cameras of the stereo rig. The calibration that you did in this post, I am curious if it takes care of synchronisation as well. Or is it just for producing 3D point clouds given two separate images from the two cameras? Do you have any suggestions of how to perform synchronization? I mean, if you have done something of this sort it would be great if you can share your experience. Thank you. I’m glad you like the tutorial! In practice, the cameras fire in a synchronized fashion – but that’s in practice. The code itself doesn’t deal with picture synchronization – that’s very connected to how you set up your rig and where you obtain your images from, whereas the library I show here is mostly concerned with producing point clouds, with obtaining the images as a secondary concern. As such, the calls to the cameras are issued sequentially, directly after one another. I’ve never noticed a lag between the two pictures, but if lag is absolutely unacceptable to you, this might be an issue. If you want to have true synchronization, you’ll probably need to have some kind of a microchip which you delegate the task of firing the cameras to. That way it can do that simultaneously. I’m not aware of any way of guaranteeing synchronicity using USB in Linux, as you’re issuing the call from userspace and then the kernel schedules the task. If truly synchronized firing is an issue for you, at the end of the day you’ll probably be better off buying a stereo rig rather than building one. Thank you for the reply Daniel. I get the general idea. Seems a difficult task for achieving complete sync, unless it is hardware synchronised. I will try with simple cameras and may be an arduino chip and see how much synchronisation I achieve. does your library work with more than two cameras? I would like to start testing with four cameras. Is it possible? What should I set to do this? Out of the box it won’t, but I’d be interested in hearing what you plan to do with 4 cameras. Strictly speak that goes beyond the realm of stereovision and indeed I don’t see the benefit of using stereovision with 4 cameras. With that many poses, what would benefit you the most would be structure from motion, which is a cooler algorithm anyway. It’s not supported by this package though, unfortunately. I thought that more cameras gives more information about 3D points and better accuracy. Can you send information about minimal requirements for python, cv2 and other packages version in order to run your library? I had some errors in calibration and tuning scripts. I’m struggling a little with your bin files you’re running. You’re using shebang files so I’m also using python 2.7. I think there is something not working with the parser for me. I can run your help file so the program seems to work fine. I installed it in windows. It seems you’re using linux. Can you tell me more about your environment? Python Version, OS, other programs and modules needed to be installed. Is this referencing C code that I can’t see? I’m a mechanical engineer trying to integrate a sensor into my project, so programming isn’t my strong-suite. I’m using Eclipse as my IDLE with pydev. I can’t seem to just run the program without any options. It just gives me the error “Show_webcams: error: too few arguments” and “calibrate_cameras: error: too few arguments.” Is there something I missed? Is there a program that needs to be edited or modified first? How does it know which device to choose? Actually, you can disregard a lot of that. I got it to work in command prompt. I guess it wasn’t as clear to me that you needed to input a number that is related to the order of the device manager menu (arcsoft web share is 0, hp hd webca fixed is 1 and this is 2). The code didn’t exactly say the format of the devices but there may be a help file for something I didn’t do in the correct order. Now, I have a different question. I’m using LI-OV580 from leopard imaging which if read like this would put a image side by side in each of the windows that show. The device has two pins if you open up graphedit and render the pins. Do you have any idea how I would modifiy this code to be able to reference each of the pins as a camera right and the other pin as camera left? I’m having trouble tracing the programs and libraries. Which library file directs to the the camera’s reference number and how would I modify that to look at the pins. Sorry for taking so long to get back to you – I don’t always see comments right away. It looks like you got some pretty involved help on the SO thread so I’ll leave you in the hands of those experts. Your question is pretty involved, and most of it seems to be related to drilling down into the pin handling with the camera. My tip would be to subclass StereoPair to deal with your specific case of camera. Then you can process the images you obtain with it using the methods of the superclass. Yeah, I had figured that part out and I found one of the github extensions had a later release that took care of it in the class. I wasn’t using the latest Stereovision release. However, I see 3 releases on github and there is a 1.0.4 in pypi. Is this from you? Do you know why Douglas Gibbons split off his own version of the code? I have some issues with the GUI crashing but I believe it’s a problem with versions of the modules/libraries I’m using. I’m also trying to run in windows and I’m sure that’s not the best for this. Do you have a working copy right now and what versions of python, argparse, opencv, matplotlib, numpy and what is your IDE? I’m using Python 2.7.14, OpenCV 3.3. I think the code was not made for opencv 3.3 or something. I reverted back to opencv 3.1 and got a little further but then the GUI starts crashing when I adjust it. It looks like the code was converted to Python 3 at some point but I’m not sure why somethings stopped working even going through the debugger. I’d just like a set of known working versions of the program that I can still download. I felt like it may have been a video or something you made that mentioned anaconda. If so, what version? Hi Justin, no, I’ve never used Anaconda for StereoVision but I don’t think it’s a bad idea. Right now I don’t have a stereo rig that I work with so it’s hard to test the code (I am an avid tester, but when hardware is involved it becomes difficult). Python 2.7 should be fine – that’s the version I developed with – but I was using opencv2, not opencv3. hey this is really very nice and informative article. 1. I cannot run any of your files in my system from the terminal. 2. I have StereoVision on pip (2 and 3) as well, can’t use them. Can you please also guide me in Stereo vision and image processing stuff? Hi Atmadeep, you’re probably having trouble with your search path – I suggest reading up on installing things with pip and finding the binaries on the search path, it’s beyond the scope of this blog. Thank you very much for these tutorials and code! Will be using it to automate and improve calibration of an industrial robot. Hi Daniel, I am Hong Seo hee, an undergrad student in Game software. I want to know the actual distance between pictures and objects through stereo vision, but I don’t know how to calculate them. I try to use Visual Studio 2015(C++) ,opencv and two cameras. After measuring the distance, I want to put on the screen two pictures and the calculated distance together.